This trail provides access to Trapper Creek Wilderness. Beautiful wildflowers and Bear Grass are abundant along the trail in season. The trail provides majestic views of Mt. Adams, Mt. Rainier, and Mount St. Helens. From Observation trail it is possible to ascend Observation Peak the site of an old fire look out via Observation Peak Trail for expanded views of the area. This trail connects with the Trapper Creek Trail making a loop through the Wilderness possible. 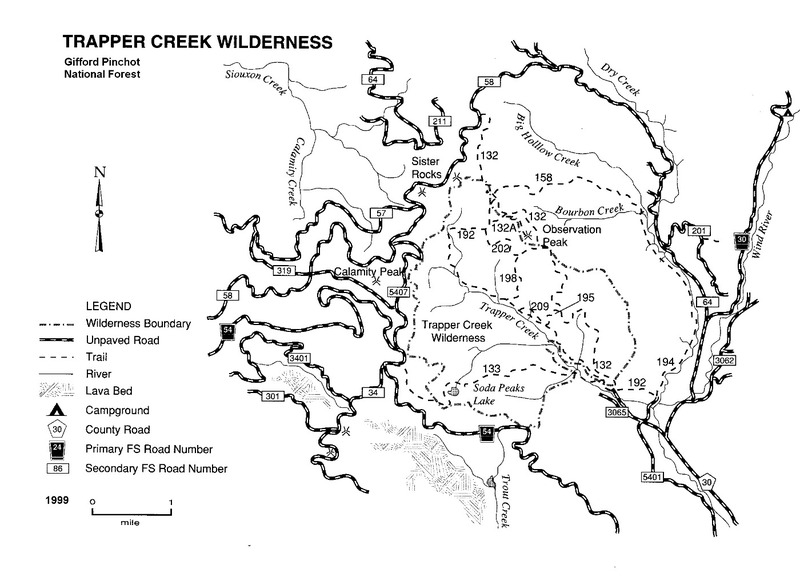 To access Observation Trail #132 from the south, follow Trapper Creek Trail #192 from Trapper Creek Trailhead 1 mile to the junction with Trail #132. From there, Observation Trail enters the Trapper Creek Wilderness and climbs steadily along the ridge through a second-growth Douglas-fir forest, gaining 2,600 feet in 5 miles as it nears Observation Peak summit. During this 5 mile section, the trail passes the junctions of Big Slide Primitive Trail #195 (at 3 miles) and Sunshine Primitive Trail #198 (at 4 miles). The trail leaves the wilderness and then passes Observation Peak Trails #132A and Trapper Creek #192 (at 6 miles) and Big Hollow Trail #158 shortly thereafter. Observation Trail #132 ends on Road 58 at Observation Peak Trailhead. Features on this trail include wildflowers, bear grass, and huckleberries. The rugged viewpoint at the northern end offers a majestic view of Mt. Adams, Mt. Rainier, and Mount St. Helens (behind the trees) on clear days.